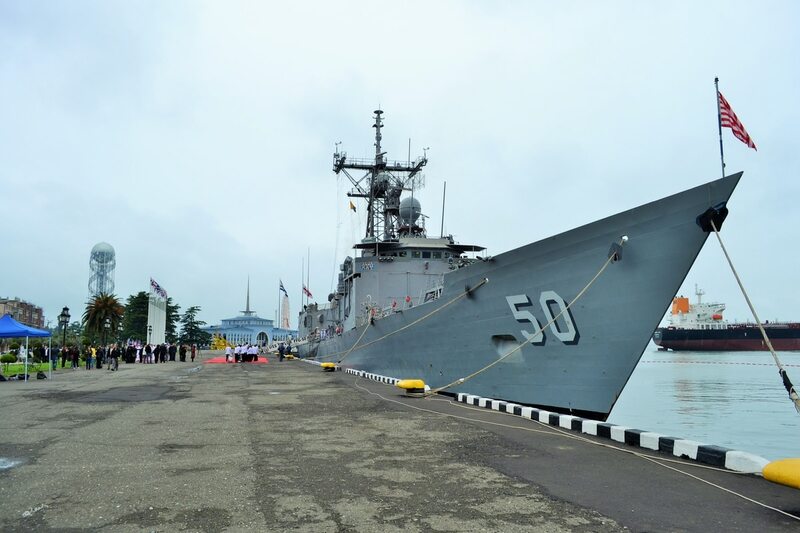 MELBOURNE, Australia — Two decommissioned U.S. Navy frigates reserved for Taiwan were handed over last week; however, analysts say Taiwan needs to put into place an ambitious plan to boost its naval capabilities against China's increasingly powerful forces. The two ships were reactivated in Charleston by VSE Corporation. Following the handover, they are scheduled to enter service with Taiwan's Republic of China Navy, or RoCN, by the end of May. Taiwan had initially requested four decommissioned Perry-class frigates, which the Obama administration approved in late 2014, but the East Asian island nation eventually settled on only two for an estimated cost of $177 million. According to Michal Thim, a Taiwan defense specialist with the Prague-based Association for International Affairs, the reactivated frigates are being earmarked to replace some of the six Knox-class frigates that serve in the anti-submarine role. Taiwan's other main naval combatants are four Kidd-class destroyers, which like the frigates are also decommissioned U.S Navy vessels. The RoCN also has six French La Fayette-class and a further eight license-built Perry-class frigates. These are fitted with Taiwanese Hsuing-Feng II anti-ship missiles, and will eventually include the supersonic HF-3, which is being retrofitted on the latter ships. It is unclear if Taiwan intends to bring the two frigates up to similar standards as their locally built equivalents, although the 2015 notification issued by the Defense and Security Cooperation Agency on the transfer of the ships includes the AN/SQR-19 Multi-Function Towed Array as part of the transfer. Taiwan had previously been blocked from acquiring the AN/SQR-19, and the retention of the system onboard the ships points to an anti-submarine focus in line with the Knox-class ships they will replace. While not exactly cutting edge, the two ships add much needed capability to Taiwan's Navy, which has found itself at the end of a determined effort by China to diplomatically isolate Taiwan. China uses its substantial economic and political clout to restrict the sale of advanced weapons to Taiwan, which it sees as a renegade province. The U.S. does, however, maintain strong de facto diplomatic relations with Taiwan's government, and the Taiwan Relations Act enacted by Congress in 1979 commits the United States to "make available to Taiwan such defense articles and defense services in such quantity as may be necessary to enable Taiwan to maintain a sufficient self-defense capability." Although in reality that has meant the most advanced U.S. weapons are out of Taiwan's reach so as to avoid incurring China's wrath. This has resulted in Taiwan trying to build up its indigenous defense industry, which has made strides in the research, design and development of advanced weapons. Although as Thim and Taipei-based military and cybersecurity analyst Yen-Fan Liao wrote in The Jamestown Foundation's "China Brief" last year, Taiwan "will still need U.S. assistance in regards to sales or technology transfer of key components." Taiwan previously had an ambitious list of 12 new shipbuilding and force modernization programs spanning 23-years and costing almost $15 billion. This list included new amphibious ships and submarines, as well as the eventual recapitalization of the RoCN's surface combatants. However, Thim told Defense News that priority should also be given to the development of the Hsun-Lien combat system. Similar to the U.S. Navy's Aegis System that Taiwan has previously tried unsuccessfully to acquire along with the Mk 41 Vertical Launch System, the Hsun-Lien combat system will be paired with a locally developed phased-array radar to provide fleet air defense against adversarial aircraft and anti-ship missiles.